Please find enclosed cheque for the work completed at the above address. I am very pleased with my new bathroom and would like to thank you both for an excellent job. Please find enclosed cheque in the sum of £..... as per your invoice dated..... I would be grateful if you confirm receipt please. I am absolutely delighted with all the work you've done on my kitchen, it has far exceeded my expectations, and I can't thank you enough for all your hard work. I will not hesitate to recommend you to any friends or clients etc that require the services you offer. 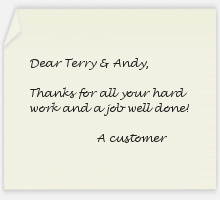 We are very pleased with the end result and the quality of work that you have undertaken for us. I am sure we will be in touch again when the next tranche of jobs comes along. we will, no doubt, get round to making a decision about the sets of doors at some stage! Thank you for your invoice dated 20 December 2006. I'm pleased to enclose settlement for invoice 1***1. I am extremely pleased with the work you've carried out on my property and would highly recommend your services in future. I will email pictures to you as a record of your work once the rooms have been decorated.